Do you ever learn a new word in English and then a few minutes later you find that you’ve already forgotten it? I know it’s frustrating, but don’t let it get you down (disappoint you)! Everyone experiences this when learning a new language. It doesn’t have to be this way. There is a great resource called Anki that you can download on your computer or smartphone. Anki is an interactive flashcard program. People generally make flashcards with small pieces of paper as a study tool. You write something on one side and the definition on the other side. Flashcards can be very useful for learning a new language: you write a word in English on the front and on the back you write the definition or the translation into your native language. So, what makes Anki better than normal flashcards and why should you download it as soon as you finish reading? What make it so effective. Anki is a program for studying that makes remembering things easier. It is more efficient than other ways of studying, so you can decrease the amount of time you spend studying and increase the amount that you learn. Anki makes learning vocabulary easier, more fun, and more intuitive. Personally, I use it on my phone because of the convenience of it; anytime I have five minutes to spare, I pull out my phone and review vocabulary. Also, anytime I learn a new word, I can add it right to Anki. No more frustration at forgetting the word you just learned! Another great feature is that you can share the study decks that you make on Anki. You can distribute them with friends and colleagues so everyone can easily build their vocabulary together! And you can download decks that other people have made on Ankiweb (I’ll talk more about that later). When you use Anki, you tell it how well you know each card. If a word or phrase is easy, you won’t be tested on it again for a few days. But if you still think it’s hard, Anki asks you again in a couple minutes. Through this, you are forced to repeat a word or phrase until it is engraved in you brain (you’ve learned it well). Anki also allows you to attach photos or audio files to each flash card, which can help you remember tougher words (especially if you’re a visual learner) and improve your pronunciation. You can choose to record audio as well, so you can record your own voice. Now let’s explore the different ways that you can use Anki to better your English. Name it and click Add (computer) or the “+” (Android). Fill in the front side with a new word or phrase (I like to include an example, too), and the back side with the definition or translation. Don’t worry about the other options right now; you can play with them later. 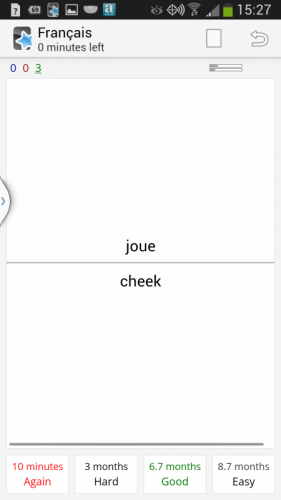 I love using Anki on my Android phone because anytime I learn a new word or expression, I can add it right away. Doing this can substantially increase the amount of vocabulary that you acquire and remember. To start out, I recommend making at least 20 cards (it helps if you keep a vocabulary journal). I use the “Basic and reversed card” option, because this requires me to study the card both ways, that is, I have to see the word and give the definition, then the next day I have to see the definition and get the word. This guarantees you will both be able to understand the word and use it when you speak. Click the Study Now button to start practicing. You will see the word and you need to guess the definition and then click Show Answer. If you got it wrong click Again. If you were correct, but you had to think a lot to remember, click Hard. Click Good or Easy if you remembered it quickly. Anki only lets you do 20 cards per day (but you can change the setting). For most people, 20 to 40 is a good number because otherwise it becomes difficult to remember them all. The more cards, the more time to study, which I understand you might not have. After a few days, you’ll be reviewing old words with the new words, so eventually, if you use Anki daily, you’ll just have a few new words each day. If you want to change any of the settings, click Options after finishing the deck. Anki has a database with thousands of pre-made decks made by other users, which you can use in addition to your personal deck. First you will have to download Anki on your computer and make an Ankiweb account (don’t worry you can transfer the deck to your phone later). On the main page click Get Shared, which will take you to Anki’s website. You’ll see there are a variety of languages and subjects that you can study. But for now we’re going to focus on English. There are about a thousand decks that you can download, including many for specific languages. In the search box to the right type in what you are looking for. Some examples are beginner, advanced, vocabulary, or TOEFL. There are a lot of options and you can try multiple decks to see which ones work the best for your needs. Some even come with audio or pictures. 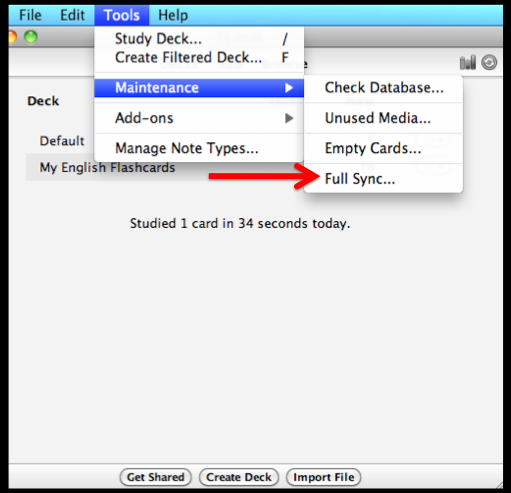 To sync the decks from your computer to your Ankiweb account go to Tools –> Maintenance –> Full Sync. You need to do this to keep Anki the same on all of your devices (computer, smart phone, and tablet). Make sure you are also signed into your Ankiweb account on your phone. Also, remember you have to sync on your phone or tablet after to get the decks. 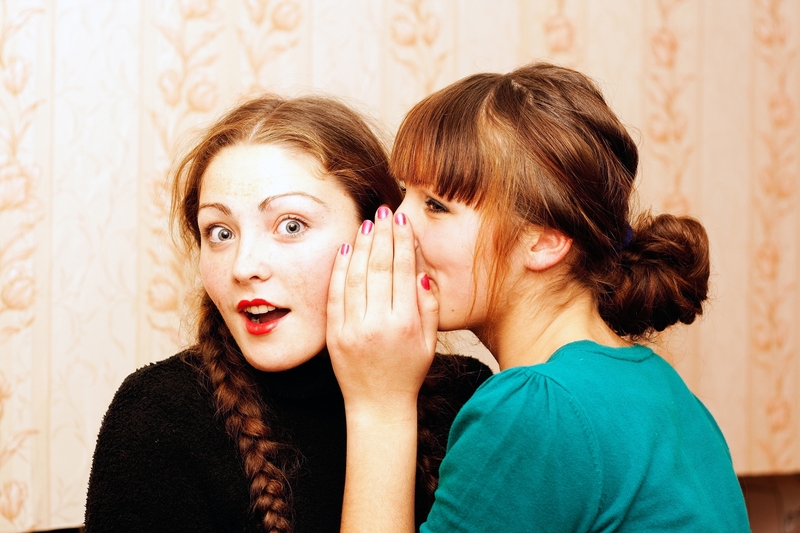 Using audio is a great way to improve your pronunciation and listening comprehension. If you have some pronunciation audio files you can attach them to a card when you make it. Or you can attach audio that reminds you of the definition (like a sound or maybe a song that uses an expression in English). You can also record audio if you want to say the word or say something to remind yourself of the definition. You can attach photos in the same way that you attach sounds. Studies have shown that when learning a language it’s more effective to relate words to images than to a translation. Now that you know how Anki functions, follow these suggestions to get the most out of (maximize) using it. Although it’s easier to download pre-made decks, you should make your own, too. Every time you read or hear a new word or expression (for example from RealLife Radio) write it down and add it to your personal English deck. Through this you will grow your own unique vocabulary and you’ll be sounding more like a native speaker every day! Download decks with audio, and then record your own voice. 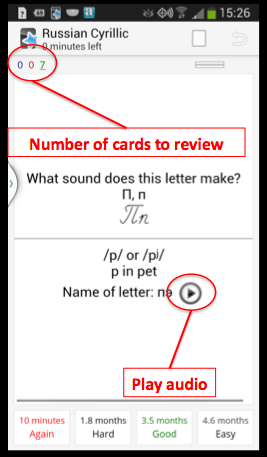 When looking at a flashcard click More and then click Record Own Voice (or press Shift+V). By doing this you can compare a native speaker’s pronunciation to your own. Don’t translate. If your English is at a high enough level, rather than translate to your own language, use a photo and/or definition to help you remember the word. 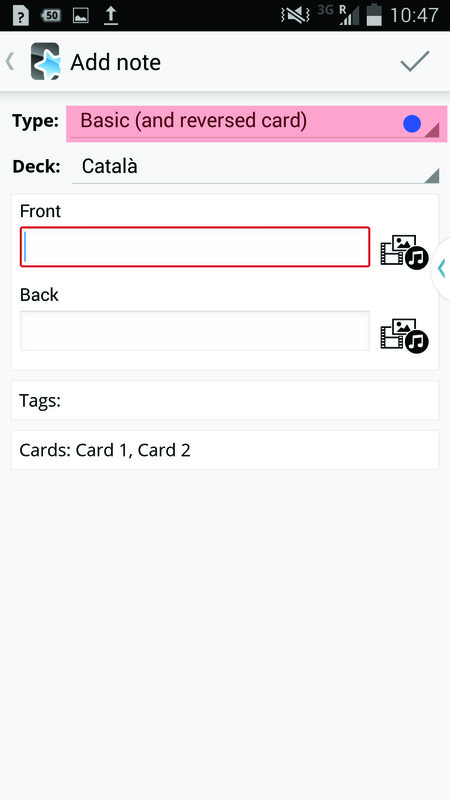 You can even put a picture on the Front of the card and the word or expression on the back. If you stop translating your brain will have to start thinking in English. Check your statistics. On your smartphone you can look at your statistics in the menu and see a ton of info about your studying, for example, the times of day you study best! Anki is an awesome language-learning tool. It is quick, easy, and effective. You are guaranteed to learn and memorize vocabulary easier by using Anki. Go download it now. You only have to commit a few minutes a day (and I know you are on your computer anyway, so make it time well spent). Download it on your smartphone or tablet and study on the bus, in line at the bank, or while on your coffee break at work—any free moment is a chance to better your English with Anki! Now you have no excuse not to build your vocabulary. Make English part of your daily life now! If you liked this article don’t forget to share it. We would love to know what you think in the comment box down below. Indeed Anki is a great software and tool to help you learn vocabulary and it does what is says, I use it myself but not the way it is intended for, it may sound a little weird, but I’ll explain what I’m talking about. I don’t like memorizing words or full sentences by flipping over cards and trying to guess their meanings, I like to use Anki to revise pages I have visited before by adding the links there so that I have the opportunity to read all the text again and acquire more and more vocabulary, I also use it to listen podcasts and watch videos again. Your method also sounds like a great way to practice languages. I may have to try it myself. Another person told me to try this program on the internet called Quizlet, it seems great to me, check it out http://quizlet.com/ !! I’m gonna use this to memorize phrasal verbs. Cuz I have a difficulty to do this and I dunno why! I’m really glad that you found my article useful! I would also recommend quizlet.com to you if you need help with memorizing those pesky phrasal verbs. Have a good night! Thanks for this post. I’m an English teacher (I teach IELTS in Singapore) and I’m in the midst of implementing the use of Anki with my students. As an English learner yourself, do you think there are other ways (more advanced) to use Anki than just merely Vocabulary memorization? I’m doing some research on different ways to use it. Glad to hear that! I recommend you check out Quizlet.com as well. It’s a great resource, similar to Anki, but it also has games that help with memorization. I usually use my phone's note app to help me memorize almost everything, including new vocabulary and english grammar related stuff, but Anki will certainly save me a lot of time. After this tip, efficiency & organization will be my "words of the day"! Thanks for sharing Ethan Zinho! I liked the program and this is the first time I use it but I do not know how Can I record my voice In order to correct pronunciation with the audio recordings in the program. Thanks for your efforts. Really great blog – although I do not know English well is a subject interests me. Thanks! Glad you enjoyed. Just keep reading and practicing and your English will get better! Thank you fop this simple & direct explanation of Anki. I am trying to study French ,I hope your explanation will help me a lot . My best regards to all of you. can assume you’re an expert on this subject. Fine with your permission allow me to grab your RSS feed to keep updated with forthcoming post. Thanks a million and please keep up the rewarding work. Thanks for all this guys! Amazing tips to enrich our vocabulary! Hey, I love this post! I actually did a video on how to use the app as well as another cool application called Linguee. If you don’t mind, I’d like to share the link so that your readers can see how to use the app as well! Enjoy and have a great day everyone!